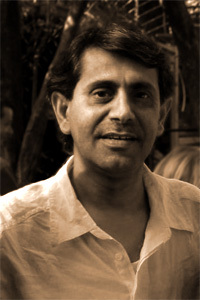 Khalid Albudoor was born in Dubai. He has published five poetry collections since 1980, and has written extensively for local and Arab publications. He was awarded the Al Khal Prize for Poetry in Lebanon in 1991. Albudoor studied mass communications at the University of the Emirates and then earned his MA in scriptwriting from Ohio University. He is active in his community, helping to establish the Emirati Writers’ Union and participating in several poetry reading nights and film festivals in the UAE and abroad. Since 1989, he has worked as a writer and presenter for radio and television programs, and has produced several documentary films and programs. He served as the director of Radio Dubai from 2000 until 2005. Albudoor is now a researcher, consultant, and writer on UAE history and cultural heritage and serves as UAE representative to the International Organization of Folk Art.